Dayle Robertson did hsi bit to try and haul Tayport back into the game. 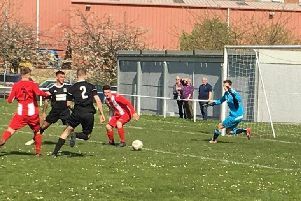 Tayport fell to their first home Super League defeat of the season when they lost by three goals against Thornton Hibs who benefited from an own goal, a penalty kick decision and a deflection. ‘Port were depleted again, and former Scottish Junior Cup winning skipper, Roberto Morris, who first signed for the club in 2002, came out of retirement to play as a trialist. Hibs opened the scoring on the quarter hour mark when Morris, in attempting a clearance, sliced into the roof of the net. ‘Port then came more into things. Dayle Robertson sent Chris Liversedge through but ‘keeper Linton was out to deny the home player. Then Craig Sturrock headed over from Jamie Gill’s free kick. On 33 minutes, what appeared to be a calamitous decision went against Tayport. Visiting Stuart Drummond went down in the box when challenged by Morris and the referee pointed to the spot, to the outrage of the home camp. Drummond himself scored past Shaw. By this point in proceedings, the referee was beginning to brandish yellow cards, but not for a poor tackle by McNab on Christie, which led to the Tayport being player taken off with a nasty ankle injury and replaced by Luke O’Brien. Ten minutes into the second half, Thornton netted their third and final counter. Josh Chalmers miscontrolled a low ball into the box from the right, Thomson pounced and his shot took a deflection to beat Shaw. The latter stages of the match were marked by confetti of yellow cards. McNab was cautioned for another bad challenge, this time on Jamie Gill. Another yellow followed in the aftermath of that incident, and he was off. Gill, who had previously received one, also got a second and he was too was ordered off, somewhat harshly. Tayport: Shaw, Morris (T), Sturrock (Gray), Paterson (Anderson), Suttie, Liversedge, Christie (O’Brien), Robertson.